2009 Cadillac CTS AWD 3.6L V6 Sunroof, Leather & Heated Seats, Media Center w/Navigation, Alloy Wheels, Dual Zone Climate Control, Bose Sound System, Certified Warranty. Ride is as smooth silk. Easy rider. When was the last time you smiled as you turned the ignition key? 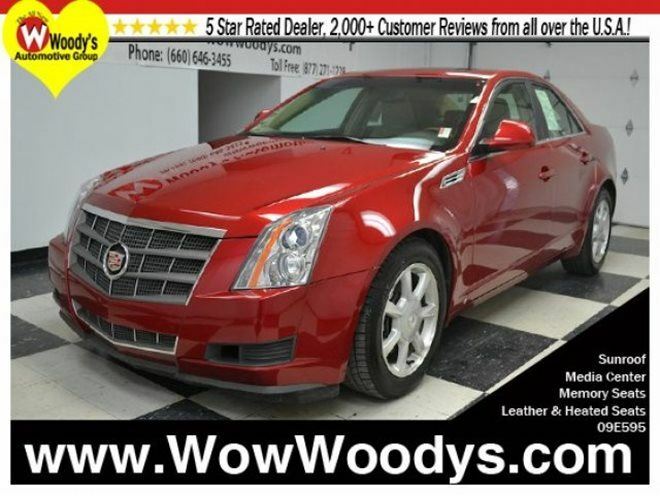 Feel it again with this wonderful 2009 Cadillac CTS. Designated by Consumer Guide as a Premium Midsize Car Best Buy in 2009. New Car Test Drive said its”…dynamics, handling and isolation are all very, very good. The level of luxury and the quality of build, fit and finish is very high, and the pure, edgy style of this car is breathtaking…” They say silence is golden. You’ll know what they meant when you drive this car at highway speeds. Road noise is a thing of the past. We will pick you up at the airport or ship your vehicle to you! If you’d like more information about this luxurious used Cadillac CTS our huge selection of other used Cadillac or 700+ vehicles located near Kansas City please visit our website and provide us with your contact information. One of our empowered Woody’s Automotive Group Sales Advisors will contact you promptly.